Although its biggest marketing push was planted firmly behind all the big Star Wars-based announcements today, Disney’s live-action panel at this weekend’s D23 Expo didn’t neglect the company’s other franchise offerings, either. Before trotting out J.J. Abrams and the cast of The Force Awakens for the big, Harrison Ford-applauding finale, the panel gave time to Disney’s upcoming spate of live-action reboots—including The Jungle Book, Pete’s Dragon, and Beauty & The Beast—as well as Marvel’s next big tentpole, Captain America: Civil War. Almost every project had some member of its cast on hand, with Bryce Dallas Howard introducing the Pete’s Dragon footage, which apparently injected the air of creepy mystery that the goofily whimsical 1977 original so clearly and painfully lacked. (As per standard convention protocol, none of the footage from today’s panel has been officially released yet, although leaks will presumably start popping up and getting slapped down as the day goes on, in the traditional game of copyright-infringing Whack-A-Mole played between uploaders and corporate lawyers since time immemorial.) Meanwhile, Jon Favreau lead Ben Kingsley, Lupita Noyong’o and Neel Sethi onto the stage for The Jungle Book, while Mia Wasikowska answered questions ahead of Alice Through The Looking Glass footage, and Emma Watson, Josh Gad, and Luke Evans all waved into the camera for pre-recorded pieces pushing Beauty And The Beast. Disney had a few non-Marvel, non-remake movies to show off as well, including the Perfect Storm-ish The Finest Hours, and The Queen Of Katwe, which also stars Noyong’o. Based on a true story, and directed by Mira Nair, the film centers on a teenage Ugandan chess prodigy whose life is changed when she’s introduced to the game, eventually travelling around the world and competing for the coveted rank of Grandmaster. On the less cerebral side of things, the studio also promoted Pirates Of The Caribbean: Dead Men No Tales, with Johnny Depp—who appeared at a ceremony last night to be honored as a Disney Legend, alongside Danny Elfman, Susan Lucci, George Lucas, and several others—showing up in character as Captain Jack Sparrow to throw grapes at people and slur onstage in a way that technically still qualifies as charm. Marvel Studios’ portion of the panel, meanwhile, was comparatively light, with president Kevin Feige showing off some concept art (and another pre-recorded video, this time from Benedict Cumberbatch) for Doctor Strange, and announcing that “Phase Two” of the Marvel Cinematic Universe was now officially complete. (He also confirmed that Tilda Swinton was set to be in the upcoming film, which has yet to begin shooting.) 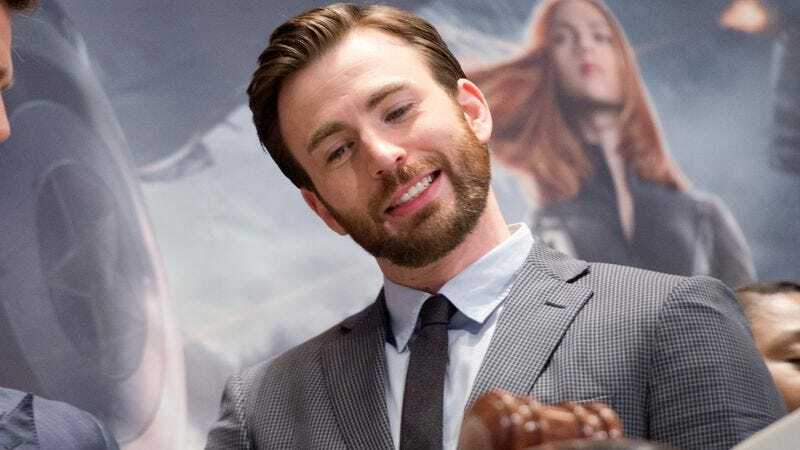 The big draw of this portion, though, was the first revealed footage of Civil War, with stars Anthony Mackie and Chris Evans showing up to introduce the superhero brawl. The trailer showcased William Hurt’s General Ross, whose calls for increased regulation for heroes seems to be the catalyst for the ensuing punch-related events. New-ish characters introduced include Frank Grillo as Crossbones (seen out of costume in Captain America: The Winter Soldier), the previously mentioned Black Panther, and Paul Rudd’s Ant-Man, who provides comic relief by geeking out when he gets to meet Captain America. (No sign of Tom Holland’s new take on Spider-Man, though.) Meanwhile, Bucky Barnes returns, Hawkeye and Black Widow face off against each other, and Robert Downey Jr.’s Tony Stark expresses an urge to punch Captain America “in his perfect teeth,” which as far as expressions of frustrations go, is surprisingly orthodontically complimentary. Presumably, we’ll know even more about what Iron Man thinks of his frenemies’ oral hygiene as Civil War’s May 16, 2016 release date approaches.